During a recent Channel Partner Bootcamp, we had the opportunity to talk openly about the challenges of running a successful Channel Partner program. It was a lively discussion. One after another, participants described a near feeding-frenzy in their market. It’s what happens when there are too few successful distributors carrying too many different product lines. Think: the closing scene in Trading Places when Dan Aykroyd and Eddie Murphy’s characters corner the frozen concentrated orange juice market. All the Bootcamp participants admitted the first hurdle—getting the Channel Partner’s attention—was the most difficult. Channel Partners are bombarded by requests as each of their principle lines vie for an unfair share of time. Inevitably, a supplier’s success hinges on its ability to break through all the clutter, demonstrate their superiority and, over time, grow a Partner’s share-of-mind (and share-of-wallet). Tall order, especially if you’re an unknown company with just a couple clever products and a beer budget. And we say that based on a track-record of successful channel programs for small, growing companies in all sorts of diverse markets (e.g., industrial controls, factory automation, embedded applications, IT infrastructure, consulting services, telecom, software). Breaking through is rarely the result of a big budget, a new product announcement or a formalized, buttoned-down partner program. Usually, it’s a matter of thinking a certain way about your Channel Partners and your follow-through execution. 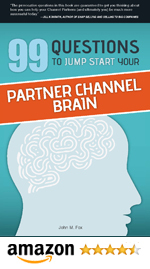 Each of the 99 Questions in this book is meant to stimulate the “Partner Channel portion” of your brain. Answering each question will shift the center of attention from you and your company and onto your Channel Partners. Don’t just answer the questions! Just plowing through the list won’t get you anywhere. Rather, we challenge you to carefully consider your answers. Have you made unrealistic assumptions? Will your own sales and marketing team members answer each question in the same way? If you and your team aren’t on the same page, how do you expect your Channel Partners to follow your lead? Discuss one question each week at your staff meeting. With 99 questions you’ve got material for 2 years!